Suzannah is a Registered Functional Medicine Nutritional Therapist, Naturopath and Health Coach. Having suffered with gut issues in the past, Suzannah discovered the power of healing through nutrition and lifestyle changes. She uses her Functional Medicine training to identify the underlying cause of symptoms and illness and to provide a personalised plan to help you reach your health goals. Suzannah has helped multiple people lose weight, balance blood sugar levels and hormones, and increase their energy levels through lifestyle and diet changes..
Suzannah also specialises in using Heart Rate Variability (HRV) technology to investigate and monitor stress levels and the state of your health. 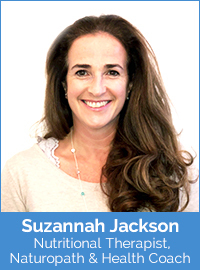 Suzannah supports her clients with personalised protocols to achieve their health objectives and bring their body back into balance, so they can enjoy optimum energy once again.